Earlier this week, my colleague Hunter Blair noted that economic data released over the past six months contained no real signs that any of the promised benefits of the Republican tax cut passed at the end of last year were showing up for workers. These benefits are certainly showing up for corporations and the wealthy households that own them—which makes sense, as the tax cut was overwhelmingly a tax cut for corporations. But the tax cut’s boosters promised that money corporations saved on taxes would quickly show up as higher wages for workers. In fact, they claimed this was happening so quickly that the tax cut was responsible for bonuses at the end of 2017 that were granted or announced before the tax cut actually became law. As silly as those arguments were, a case that corporate tax cuts will lead to wage increases does exist in economics textbooks. The most crucial link in the chain leading from cutting corporations’ taxes to workers seeing higher paychecks runs through increased business investment in plants, equipment, and research. Essentially, lower corporate taxes are supposed to incentivize businesses to undertake more investment in productivity-enhancing plants, equipment, and research, and induce extra spending to finance these increased investments. This extra investment is supposed to lead to higher productivity, and hence to higher wages for workers. I should note that most of the links in this chain are broken, but for now, let’s just focus on the first—the effect of the tax cut in spurring business investment. If that fails, the whole case for tax cuts boosting wages fails. The figure below shows the percent change in business investment relative to the same quarter in the previous year, with the vertical line showing when the tax cut was passed. The data is from the Bureau of Economic Analysis (BEA), National Income and Product Accounts (NIPA) Table 1.1.3. It is awfully hard to see a real regime change here in investment behavior. Occasionally, tax cut defenders will urge some patience, arguing that it takes some time for new investment to be order and installed. This is fair enough (but what about those bonuses paid before the tax cut became law and yet claimed as its vindication? ), but orders of new capital goods (i.e., investment plans) can be made as soon as the law takes effect. If locking in lower tax rates is supposed to make firms want to invest more, six months should be enough time to see this in data tracking capital goods orders. 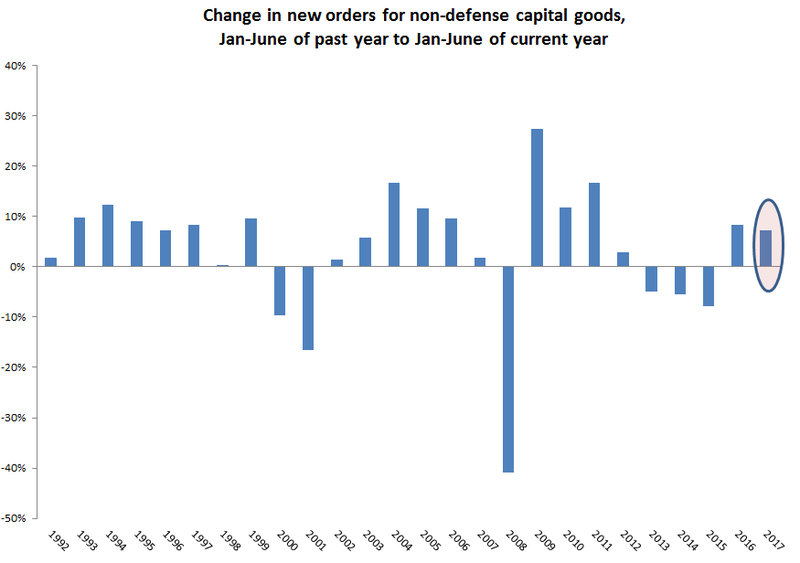 The figure below shows capital goods orders for the first six months of each year since 1992. The data is from the Census Bureau’s Manufacturing, Shipments, Inventories and Orders data. The 2018 bar (the last one on the right, circled) is entirely in the period of time when the effect of the tax cuts took hold. This certainly does not make the tax cut look like an investment game-changer. Finally, it is true that both of these graphs show pronounced investment weakness starting in 2014 and running through 2016. Investment clearly began improving in early 2016. 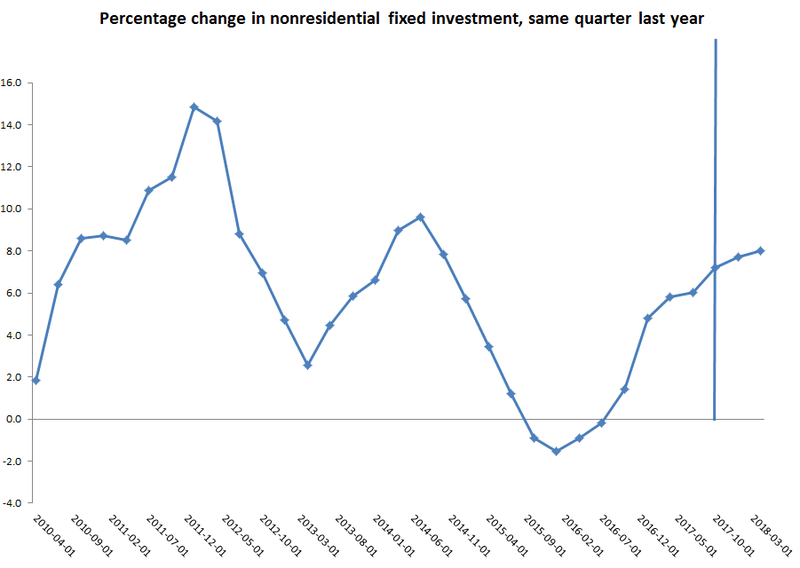 None of this lines up well with the tax cut’s effect, but it’s worth looking at why investment was doing ok in the early part of the recovery from the Great Recession but then faltered. The answer seems clearly to be that American business investment has become largely driven by investment in energy extraction, and since 2007 it has risen and fallen in response to rises and falls in energy prices. 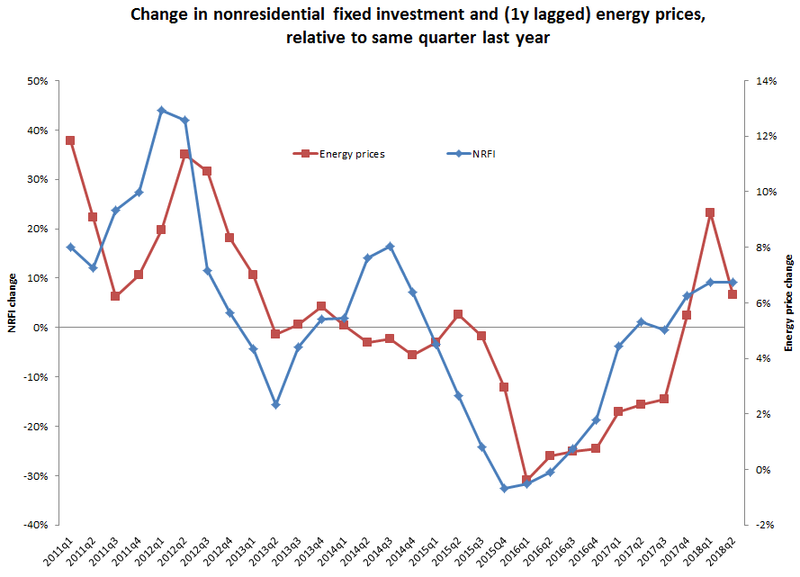 The next figure shows the year-over-year change in business investment since 2011 lined up with the year-over-year change in energy prices, but lagged one year. 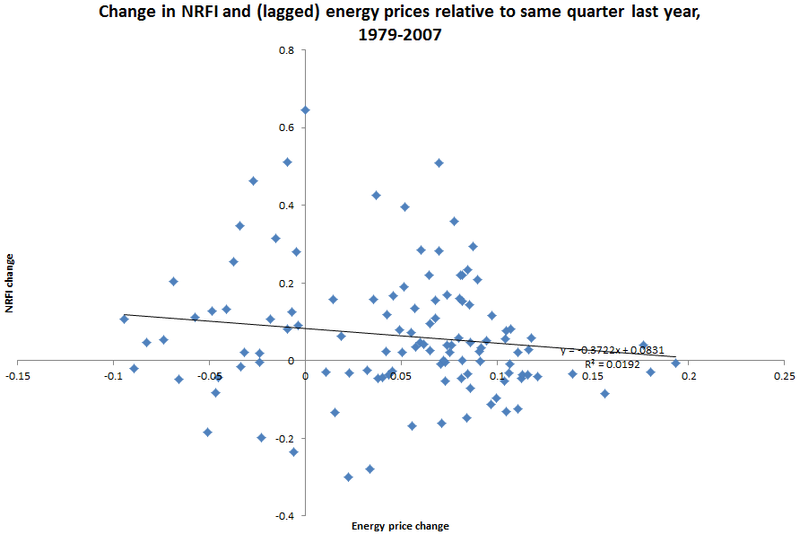 The investment data is the same as in the first figure, and energy prices are from the BEA NIPA table 2.3.4 (gasoline and energy price deflator). The fit is very tight, with a correlation of 0.73. This correlation is a very new development. Here’s a scatterplot of these same series for the period from 1979–2007. There is essentially no relationship. Where does this analysis of investment trends leave us? First, the tax cut shows no sign of boosting investment, and, this is a necessary (not sufficient, but necessary) condition for it to boost wages. In the end, we all know that this is just one more tax cut for corporations and the rich that will not trickle down at all to American workers. Second, non-energy investment in the United States is extremely sluggish, and we should work hard to boost it. The most direct way to boost it is by undertaking public investment (infrastructure would be a good start). We should also try to make sure labor markets are as tight as possible, to goad employers who have become complacent about economizing on labor costs because workers have been so cheap in recent years. Faster wage growth could well kickstart some business investment.